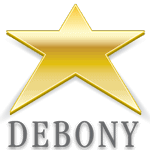 [vc_row][vc_column width=”2/3″][vc_column_text]Debony Salon is an ever-changing entity, always keeping up with current trends and education, bringing its clients the best in services and products. 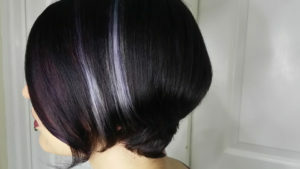 about the wild side of color that gives you turquoise hair, purple, yellow, silver, and, pink hair. Reading, watching tutorials, researching products and practicing on our own hair, we’ve been striving to perfect those pastel, jewel-toned and neon highlights and balayages that have become so popular across pinterest. We recently wrote about the new “Urban Shock” colors that came to the salon, which we have been having fun with. To compliment these new fashion permanent colors, we have brought the new Celeb Luxe line, “Viral” into the salon. What differentiates “Viral” from “Urban Shock” is that “Viral” is a colorwash system, as opposed to a demi or semi-permanent dye. It’s a shampoo and conditioner duo that provides intense moisture and conditioning, as well as a coloring system. Meaning you can come into the salon to have a color treatment to reach your initial style and color, and then take home the color of “Viral” shampoo to use at home to help make your color last longer between salon visits. It adds color while cleansing and is designed to stop color from visible washout and fade. “Viral” is a a sulfate-free formula and creates a rich lather as your shampoo. It comes in wide variety of colors from silver all the way to hot pink. It is also free of sulfates, parabens, ammonia, peroxide, PPD and gluten and is 100% vegan. Another great aspect of this shampooing system is that the dye within it doesn’t stain your bathroom tiles. 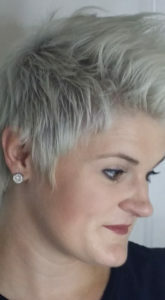 tones on darker color hair, based on selection of color. This means, if you have dark hair and are looking to achieve pastel colors, you still have to decolorize your hair. Before “Viral,” and fresh color would need to be nurtured by reducing the amount of time spent washing your hair. Now with these shampoos, they replenish color, and prevent it from looking washed out and faded. Alternate your shampoo with “Viral” moisturewash,™ no color shampoo, to manage vibrancy of hair color tones. This helps to minimize the up-keep and amount of damage done to your hair from traditional decolorization and coloring services. Debony Salon is now offering this coloring service as well as the shampoos for retail in the salon! Already the girls have been having fun and trying new colors on each other and loving the results. In both photos above, Jaimie and Tarmey’s hair were washed using the Silver “Viral” shampoo.